Safely move the vehicle off the road and away from traffic. Park on a level surface and apply the parking brake. Shift the automatic transmission (A/T) or the models into P (Park) or the manual transmission (M/T) model into R (Reverse). Raise the hood to warn other traffic and to signal professional road assistance personnel that you need assistance. Have all passengers get out of the vehicle and stand in a safe place, away from traffic and clear of the vehicle. Make sure the parking brake is securely applied and the automatic transmission (A/T) models is shifted into P (Park), or the manual transmission (M/T) model into R (Reverse). Never change tires when the vehicle is on a slope, ice or slippery areas. This is hazardous. Never change tires if oncoming traffic is close to your vehicle. Wait for professional road assistance. Place suitable blocks at both the front and back of the wheel diagonally opposite the flat tire to prevent the vehicle from moving when it is jacked up. WARNING Be sure to block the wheel as the vehicle may move and result in personal injury. Remove the jacking tools from the storage location. Loosen the bolt 1 counterclockwise to lower the spare. 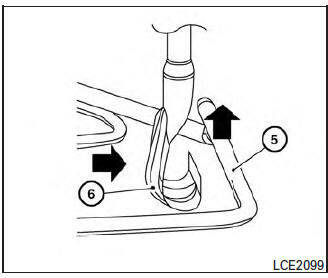 Stop turning the bolt when the spare is lowered to the point where the tire basket 2 can be removed from the hook 3 . Remove the wheel basket by pushing the basket upward. Lower the tire basket to the ground and take out the spare. 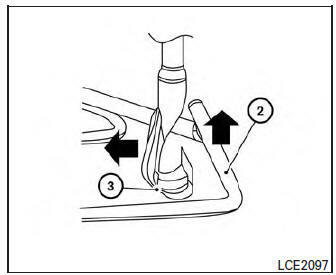 To remove the wheel cover, use the jack rod 1 as illustrated. 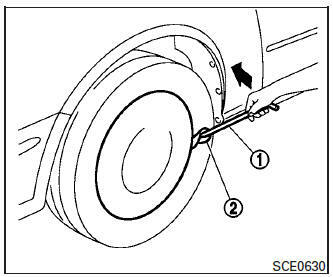 Apply cloth 2 between the wheel and jack rod to prevent damaging the wheel and wheel cover. CAUTION Do not use your hands to pry off wheel caps or wheel covers. Doing so could result in personal injury. Use caution not to scratch the wheel cover or wheel surface. Never get under the vehicle while it is supported only by the jack. If it is necessary to work under the vehicle, support it with safety stands. Use only the jack provided with your vehicle to lift the vehicle. Do not use the jack provided with your vehicle on other vehicles. The jack is designed for lifting only your vehicle during a tire change. Use the correct jack-up points. Never use any other part of the vehicle for jack support. Never jack up the vehicle more than necessary. Never use blocks on or under the jack. 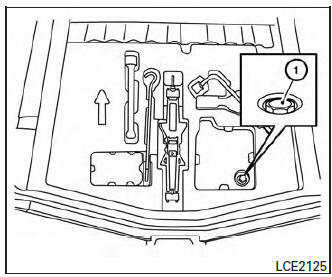 Do not start or run the engine while vehicle is on the jack. It may cause the vehicle to move. This is especially true for vehicles with limited slip differentials. Do not allow passengers to stay in the vehicle while it is on the jack. Never run the engine with a wheel(s) off the ground. It may cause the vehicle to move. 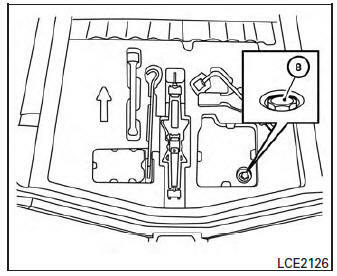 Always refer to the proper illustrations for the correct placement and jack-up points for your specific vehicle model and jack type. Carefully read the caution label attached to the jack body and the following instructions. Loosen each wheel nut 1 or 2 turns by turning counterclockwise with the wheel nut wrench. Do not remove the wheel nuts until the tire is off the ground. Place the jack directly under the jack-up point as illustrated so the top of the jack contacts the vehicle at the jack-up point. Align the jack head between the 2 notches in the front or the rear as shown. Also fit the groove of the jack head between the notches as shown. The jack should be used on firm and level ground. 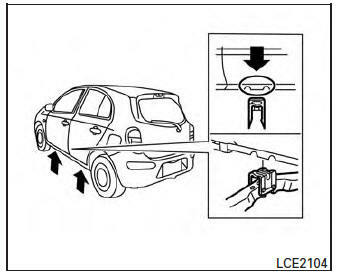 To lift the vehicle, securely hold the jack lever and rod with both hands. Carefully raise the vehicle until the tire clears the ground. Remove the wheel nuts, and then remove the tire. Clean any mud or dirt from the surface between the wheel and hub. Carefully put the spare tire on and tighten the wheel nuts finger tight. 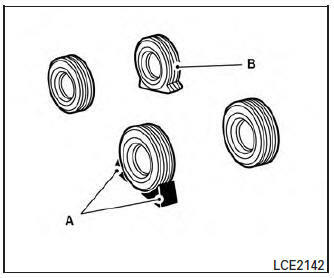 With the wheel nut wrench, tighten wheel nuts alternately and evenly in the sequence illustrated ( A , B , C , D ) until they are tight. Lower the vehicle slowly until the tire touches the ground. 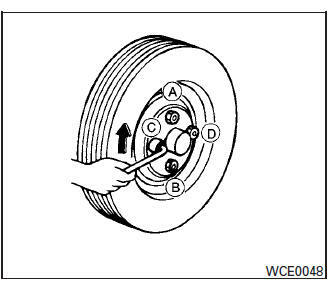 Then, with the wheel nut wrench, tighten the wheel nuts securely in the sequence illustrated ( A , B , C , D ). Incorrect wheel nuts or improperly tightened wheel nuts can cause the wheel to become loose or come off. This could cause an accident. Do not use oil or grease on the wheel studs or nuts. This could cause the nuts to become loose. Retighten the wheel nuts when the vehicle has been driven for 1,000 km (621 miles) (also in cases of a flat tire, etc.). The wheel nuts must be kept tightened to specification at all times. It is recommended that wheel nuts be tightened to specification at each lubrication interval. Adjust tire pressure to the COLD pressure. COLD pressure: After the vehicle has been parked for 3 hours or more or driven less than 1.6 km (1 mile). COLD tire pressures are shown on the “Tire and loading information label”. 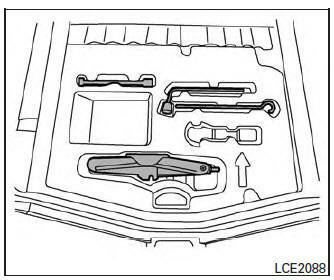 Securely store the flat tire and jacking equipment in the vehicle. WARNING Always make sure that the spare tire and jacking equipment are properly secured after use. Such items can become dangerous projectiles in an accident or sudden stop. The spare tire is designed for emergency use. For additional information, refer to “Wheels and tires” in the “Maintenance and do-it-yourself” section of this manual. After the flat tire is repaired, return the temporary spare to its original position in the tire basket under the rear of the vehicle. Loosen bolt 1 counterclockwise approximately 20 turns using the wheel nut wrench and wrench extension to lower the tire basket. Stop turning the bolt when the tire basket is lowered to a place where it can be removed from the hook. Do not loosen the bolt excessively, otherwise the basket may fall suddenly. Hold the tire basket and remove it from the hook by pushing the basket 2 upward and moving the hook 3 to release the basket. 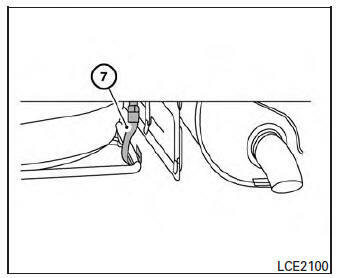 Please be sure that the hook is located as shown in the image 7 . The hook must engage from the inside of the basket. Tighten the bolt 8 clockwise until the bolt is tight using the wheel nut wrench and wrench extension to move the tire basket up to the holding position. Always make sure that the spare tire, tire basket and jacking equipment are properly secured after use. Such items can become dangerous projectiles in an accident or sudden stop. The spare tire is designed for emergency use. For additional information refer to “Wheels and Tires” in the “Maintenance and do-it yourself” section of this manual. When reinstalling the spare tire basket under the vehicle after use, be sure that the hook engages the basket from the inside. 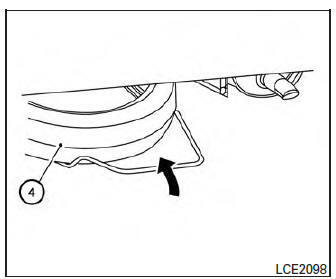 If the spare tire basket hook is not engaged properly, there is an increased risk of the spare tire separating from the vehicle in a crash and causing injury. 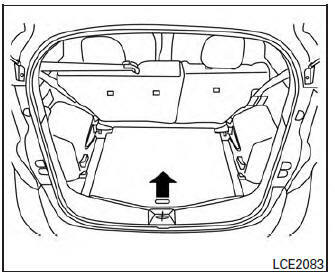 Securely store the damaged tire in the cargo area as illustrated. Securely store the jack and tools in the storage area. 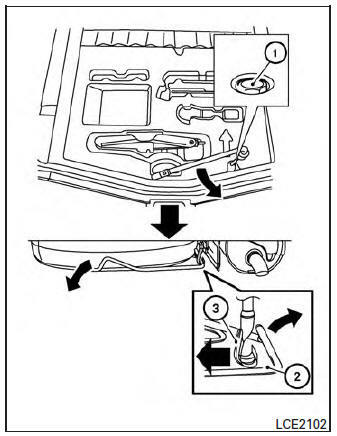 Return the spare tire basket back to its original position in the reverse order of removal. For additional information, refer to “Getting the spare tire and tools” in this section. 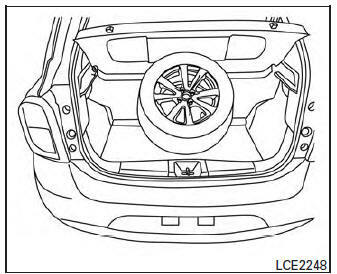 NOTE: The spare tire basket cannot be used to store the conventional tire. Always make sure that the spare tire and jacking equipment are properly secured after each use. Such items can become dangerous projectiles in an accident or sudden stop. Make sure that the spare tire basket is properly secured in its original position after removing the spare tire. The spare tire and small size spare tire are designed for emergency use. For additional information, refer to “Wheels and tires” in the “Maintenance and do-it-yourself” section of this manual.